In part four, John Riley shows us how to adjust brightness and contrast easily in Photoshop using Levels. We continue our look at some basic steps in preparing and improving our images in Photoshop. Although there are many ways to adjust brightness & contrast, we shall look at some basic techniques while attempting to keep things as straightforward as possible. Adjustment/Brightness/Contrast or similar. Sliders and a tick box to select the preview of the effect being produced makes for simple, but limited adjustments. Levels is a better option. Before we look at this more versatile method, a word about the Histogram. This is often used in camera and often misunderstood. 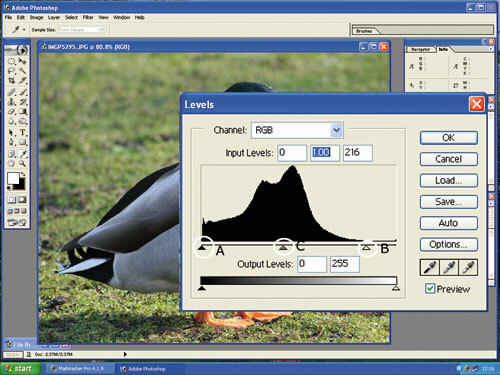 In the illustrations below Histogram 1 shows a largely dark image and the histogram therefore shows lots of dark pixels and tends towards the left. For this image, it is correct and reflects what is actually in the picture. Histogram 2 has large areas of white and the histogram shows this by spreading into the right side. There are still plenty of dark pixels, but a dip in the centre as there are few mid tones. Histogram 3 is more often than not what we expect, but this is only correct if the subject contains mainly mid-tones, as here. It’s important to remember that all these histograms are equally “correct” so we need to look at the histogram and relate it to the type of image that we have. An image with many dark areas will show a histogram tending towards the left. There are still plenty of dark pixels in this image, but the white areas spread the histogram to the right. An image with plenty of mid tones produces a more evenly spaced histogram. The basic technique is fast and simple. In the above screenshot I’ve marked the input sliders as A, B and C. First adjust A and B so that they touch where the histogram starts. In this example, I have moved C to the left to meet the main body of the histogram. backed it off a little to the right. Then adjust slider C to finalise the overall brightness. Click OK and the job is done. This is very effective and gives more control over the final appearance of the image. aware of. Click a box, left to right, to select black, grey or white. Then click an area in the image that you want to define as appropriate. An example is copying a document of black text on white paper. Click the black box and click some black text. Click the white box and click the paper base. Then the image will be pure black text on pure white paper. Next time we will be looking at the first of some sharpening techniques.